Lush always has the most amazing handmade cosmetics and I love their new Halloween collection. I am a massive fan of Lush, I’ve mentioned them so many times on the blog and attended their blogger events, here, here and here. They have done us proud with their Halloween collection this year with such unique and striking creations. My favourite of these items has to be the Fairy Ring Toadstool Soap. I would love to be able to buy the entire thing as it looks incredible but may settle for buying a slice of the soap to try. The Fairy Ring Toadstool Soap is actually made with fresh mushrooms as well as Jasmine absolute, ylang ylang and vetivert oils. The mushrooms used in the toadstool soap are Shiitake mushrooms that contain nutrients, are said to improve blood circulation and are antibacterial. The other item that has really caught my eye and will be a definite purchase when I pop into Lush is the Sparkly Pumpkin Bubble Bar. The colour they have given it looks amazing and I love how much sparkle Lush bath products can give. The pumpkin bar offers an energising blend of juniperberry, lime and grapefruit oils in its ingredients. Getting nearby is also Bonfire night and the Sparkler Bath Bomb will get the mood rights with its crackling and fizzing Rose Jam scent. The bath bomb apparently fizzes and crackles in an explosion of colour, spinning around the bath turning it into a fiery, shimmering display so I think this is definitely something I have to try! Wizard Bubble Bar – Weariness, begone! 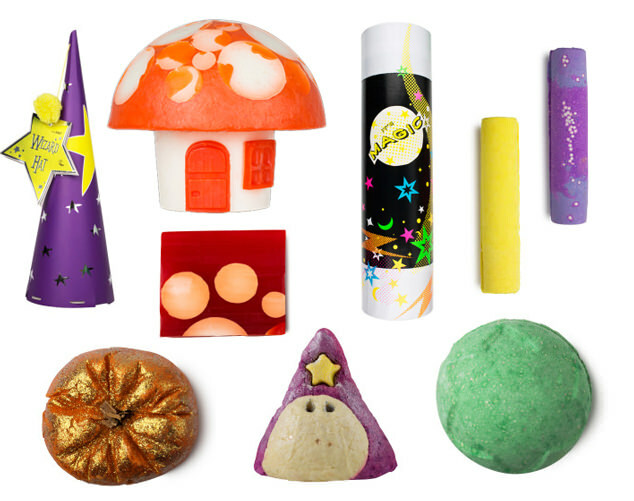 Which are you favourite Lush Halloween Products 2014?